It is designed for gluing a side label onto metal cylindrical cans with a volume of 0.1 to 1 liter. It is the only labeling machine with thermal insulation of the glue pan, which allows to obtain a significant reduction of power consumption (~ 4-5 times) and shortening of time required for heating up the glue. The time for switching to another jar size is several times less than in machines of other manufacturers. LLC “Prodmash” is the main manufacturer of labeling machines on tin cans in the CIS. Annually we produce and sell 20-30 pieces. Our partners are canning plants of Ukraine, the Republic of Belarus, the countries of the European Union, Kazakhstan, Moldova, the Russian Federation, etc. Experience in manufacture of labeling machines since 1990. During this time more than 500 machines were produced. There is no other such enterprise with so much experience in this field in the CIS. ОБ-КЭТ-С2 was developed and launched in batch production in 2003. Since then more than 250 machines of this model have been manufactured. Many years of experience in such equipment production was taken into account in the machine development. Forgeries for this models are sold on the CIS market (usually with the same name: ОБ-КЄТ-С2, ОБ-КЄТ-С1). 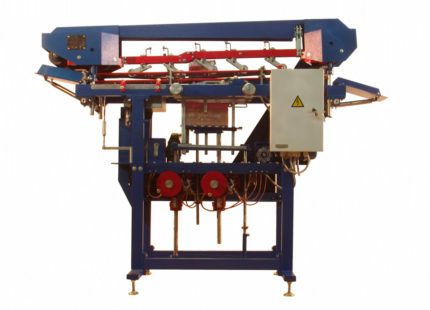 Such machines have simplified design (many nodes and mechanisms are simplified), non-quality, cheap materials and components are used, which leads to decrease of work quality and the service life of a machine. 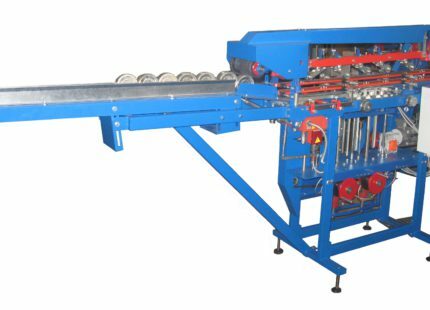 Similar equipment of other manufacturers basically includes machines developed in the early 1970s of the previous century and since then their modernization has not been performed or has been unessential. The savings of adhesive and electricity in the monetary equivalent is ~ 100 … 500 $ per 1 million cans. (depends upon the can’s size)!! !Durability of ОБ-КЭТ-С2 shall be noted. The machine with the serial No. 1 was sold in 2003 to the canning plant in Zolotonosha town, Cherkasy region. Machines were supplied to the same plant in 2004 and in 2005. Machines are operated intensively. At the moment all three machines are working. When using cans of different standard sizes, a reconfiguration tool kit is required. In similar competitor machines, the most labor-consuming process is to reconfigure flue pan and the lane over it, when reconfiguration may take hours. In ОБ-КЭТ-С2, we design customized equipment set for flue pan and lane over it for each individual order. Besides, reconfiguration of the pan and the lane, usually, takes little time during operation. The most expensive reconfiguration kit is the one for cans No.1 or No.2, since these cans require a more careful testing and tuning on the manufacturer’s site. It is used for smooth adjustment of machine performance. It is especially important when the machine is a part of a production line allowing alignment of labeling machine performance with the performance of other machines and devices in the line. Besides, the inverter extends machine life time in cases when maximum performance is not required. Also, inverter has a “setup mode” programmed in it. This mode allows machine operation at the lowest speed which comes in handy for machine setup or reconfiguration from one can to another. The basic model utilizes mechanical drive of glue gear pump and glue dosing is quite efficient (glue consumption is 3…5 times lower than in similar machines from other manufacturers), but it still does not reduce glue consumption down to minimum, especially when the cans of different height are used, since the maintenance personnel does not usually readjust glue dosing when reconfiguring from one can size to another. Besides, mechanical system makes the use of high-viscosity glue (which is the most effective) next to impossible because it may result in can deformation. Increased glue consumption can be observed when the cans are used that differ in their height greatly (e.g., cans No.1 and No.9). The use of electronic control for glue system feeding eliminates the deficiencies of the mechanical system. The system controls stepping motor that drives gear pump. This system can adjust the dose of glue fed to a label within a wide range, which makes it possible to minimize glue consumption. 2) use high-quality high-viscosity glue, which increases labeling quality. 3) reduce the risk of deformation of cans made of thin and soft tin, especially those with non-corrugated rim. If labeling takes place in the warehouse of finished products and machine requires lot of moving around the warehouse, it is recommended that the machine be mounted on the wheels. In this case the machine is both equipped with the wheels and with the fixed supports. In the majority of cases the inclined feeding trays are used. The trays, manufactured internally by the canning plants, are, in the majority of cases, made incorrectly and are inefficient. This reduces machine performance drastically. 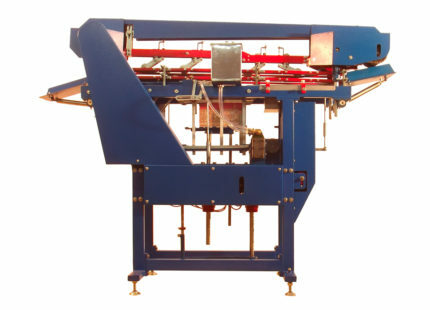 Integrated feeding tray, manufactured by Prodmash LLC, has all necessary adjustments, effectively completes labeling machine and the machine potential is used up to its maximum. Delivery of equipment to the Customer’s warehouse. It can be carried out by the manufacturer at the expense of the Customer on the terms of CPT, Incoterms-2000. The cost of delivery shall be agreed with the carrier. Customs clearance in the Russian Federation. In case of impossibility to carry out customs clearing by the Customer, we recommend to contact our dealer on the territory of Russian Federation LLC “BESTEQ-Engineering” in Rostov-on-Don. • cost of the adjuster’s accommodation in the hotel at the time of pre-commissioning activities. Our best Manager will call You soon.